Are you a motorbike enthusiast without a ride? Does the call of the road, the lure of black leathers, and the excitement of an unplanned adventure with fellow bikers beckon to you? Then you’ve probably visited your fair share of dealerships and websites, looking for the perfect motorbike. Of course, you can’t go on price, colour, and the purr of the engine alone. Those are important, sure… But there’s just a teensy weensy bit more to it than that. And we know what we’re talking about, because we’ve done the legwork. We went all biker mad a while ago when we were launching our super cheap motorbike cover and let’s just the say that the biker bug bit. We’re hooked and are royally qualified to give you the ins and outs of buying your first motorbike in just 3 steps. The actual first thing you need to do is figure out how much you’re going to spend on your 2-wheeler. You might have some cash saved up already or a savings plan to get you to a deposit amount or to make the whole purchase. Or you’re thinking of getting finance from a dealership or the bank. Dealerships tend to offer financing and that might be good, especially if they give you a low interest rate. If that doesn’t happen, give the banks a shot and see what they can do for you. The money stuff is a big deal and you need to make sure you understand what you’re committing to. Things like a balloon payment might take the edge off the repayments at first, but you’ll have to pay a lump sum at the end of the loan period. Or a relief period of 2 months during which time you can ride around without paying, which sounds good but could include interest being charged during those 2 months. Looking for the bike of your dreams is more than just spotting the right colour. There are a lot more factors to consider, but in our opinion there are 3 main considerations that you should keep at the top of your mind when browsing for your first bike. The first is what you’ll use your motorbike for. Are you planning on using it to get around town? Or are you going to hit the open road and cruise with your beloved on the back? Perhaps you just want to hit the open air on your own, roadtripping like the lone wolf you are? What the bike will do, will determine the type of bike you choose. The second thing is price. Price is a big determining factor, even more important than what you look like sitting atop the bike in the dealership. Once you know what you can afford, you’ll know whether you’re aiming high for the biggest and best or avoiding the latest and greatest in favour of something more affordable. The third factor is safety. Regardless of what type of bike you choose or what you want to use it for, you need to prioritise safety features. The latest tech in brakes and all that jazz, because you will be more vulnerable than some 1 in a car or truck. Our advice? Go full biker-nerd, hit up a few dealerships and ask all the questions and sit on all the bikes. Better yet, go with a biker friend. Some 1 you trust and has a good driving track record. A biker Yoda of sorts, who can steer you right. If your bike is being financed, then you’ll need comprehensive motorbike insurance. Even if it’s not financed, you should get insurance. The king’s cover is your best option. And we’ll tell you why. Firstly, it includes cover for accident damage, theft and hi-jacking, liability to other parties, plus medical expenses. It also covers some accidental damage that happens at track school. That might not mean much to a non-biking fanatic, but if you’re here as a true fan and in need of our brilliant guidance… This is good news, indeed. 4 options: You can choose between comprehensive, third party and theft, theft only, and third party only. We cover more: The king covers business use (not deliveries), licensed learner riders, and pre-approved track school. 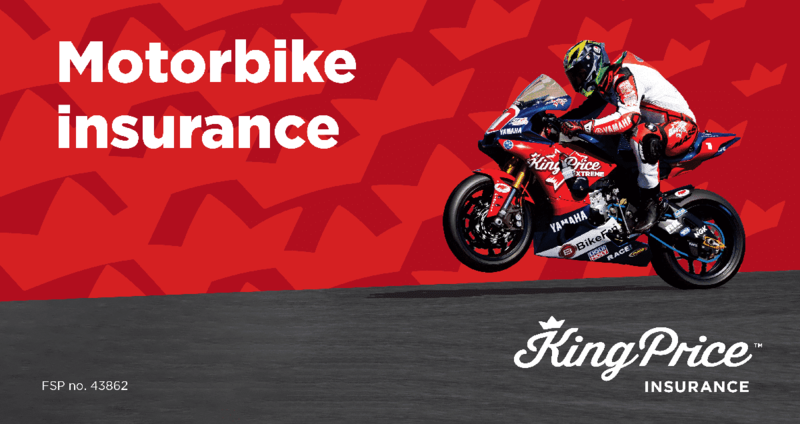 R1 insurance: You can choose to insure your bike gear for just R1 with our comprehensive option, like your helmet or leathers. Pricey stuff that you’d want to cover. If you don’t already have our royal touch in your life, take the first step right now and get a commitment-free quote here or call our royal client care team on 0860 50 50 50.